3 day of Yoga, Meditation, kirtan music concerts with Masood and a lot of great fun and laughs as this thriving communities of yogi come together in Monterry Mexico. Sianna Sherman and Dhrama Mittra will be teaching as along with many more great teachers. UDAYA LIVE is an all-inclusive international retreat in Bulgaria in SE Europe. Join us for yoga, fitness, live music, dancing, swimming, community, and fun in the sun… just like summer camp. Celebrate your practice with a community of some of the finest and most diverse yoga teachers & musicians. Drop into an invigorating vinyasa class and flow to a live band, jump into a dance class and shake it or follow your bliss to a restorative or meditation class. Suit yourself by curating your own ideal experience. One glorious weekend at the famous Esalen Institute in Big Sur. Healing hot springs on the cliff-side with breathtaking views whales crossing the ocean. Organic foods from their own veg garden. The most wonderful massages available on the planet. All setting the scene for some fun inner journey of self discovery and breakthroughs. World renowned yoga and empowering teacher and I will guide and nurture the spirit of sacred relationship. Exploring emotional intimacy and holding space for your deeper journey into your relationship with your beloved. This is not sexual practice retreat but a celebration of the divine and scared union of couples in a committed relationship for the opportunity to explore the unknown treasures and tools to a fulfilling and loving partnership. Sianna Sherman has hosted Yoga retreats at Esalen and has her own global Yoga school called Rasa Yoga and held sacred space and rituals for women for decades. Masood has been exploring the embodied sacred relationship also as a father and what it is to be a man in a sacred and emotionally intimate relationship with clear and supportive communication. This workshop is designed for couples of all gender and sexual orientations. Thank you YOGAFORT for bringing me back for a 3rd year. This really is one of my favorite festivals in the USA !! Yogafort is a 3-day mini-festival within a festival featuring yoga and dance classes all to live music. Instructors and musicians from the global yoga community descend on Boise during Treefort Music Fest to ignite the heart and soul to our unique festival experience. Yogafort is your place to drop-in for a recharging yoga session, get your sweat on, and find center amongst the hubbub of festival life. We are here to anchor you! Music is the trunk of Treefort. We get our biggest thrills from welcoming spellbinding well-known and independent emerging artists from all over the globe. Since the festival’s inception, Boise has played host to thousands of bands traveling from within the Treasure Valley or as far as Western Europe, the Middle East and Australia. Just like the uniqueness of every tree, each Treefort Music Fest features a wide variety of musicians and bands – every Treefort moment has its own soundtrack. So excited to return for the 3rd year to this super fun festival in Costa Rica. I will be giving a kirtan concert, teaching and supporting the wonderful master yoga teacher Sianna Sherman. In an ever-changing world, we are being asked to step up in many ways. Yoga is a path of embrace. We are being called to activate our voice, know our shadow, open with vulnerability, awaken emotional intimacy, and bring our authentic gifts to the world. If you are reading this email, you are likely someone who has a deep love and commitment, or curiosity to learn about and immerse into the multifaceted layers of who you are. EMBRACE: Yoga, Voice, & Emotions and I warmly invite you to join a global community of yogis and yoginis who are committed to realness, justice, transformation, and cultivating a radiant life through the practices of yoga. In a nutshell, we’re an inspired collective of individuals who are ready to step up and co-create with our authentic gifts for the true benefit of all beings. This is the type of change so needed on our planet right now. We will share tools, tips, stories and wisdom to illuminate a life of EMBRACE. Please join me, along with a diverse panel of inspiring leaders of all ages and backgrounds as we embrace our journey as sacred, authentic, and intimate with the whole of our being. CLICK THIS LINK TO HEAR ALL THE SPEAKER BUT DO IT NOW BECAUSE THIS WILL BE TAKEN DOWN NEXT WEEK. 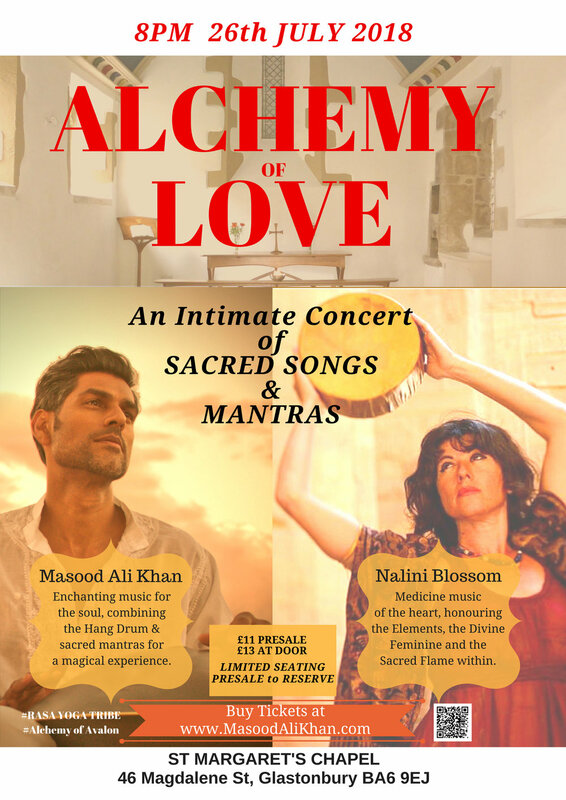 A rare opportunity to experience this unique heart & mind healing combination of sacred mantras and Hang Drum from Los Angeles based musician Masood Ali Khan. Returning back for the 2nd year to Bala Yoga for an evening of Kirtan, ceremony and heart medicine songs. The enchanting and much sort after Hang drum from Switzerland, delivers a penetrating field of harmonic sound. The resonance uplifts and inspires the creative potential of the listener. Add that with the scientifically proven results of chanting & singing and also the sounding of the powerful transformational yoga Hindu mantras. The participant within themselves changes their own energy vibration and the field around them. Masood then guides the group to use this energy for their own healing and specific focusing techniques to transmit this energy for the greater good of humanity. Also Supporting Sianna Sherman for 2 Rasa yoga public classes at Bala Yoga. music, ceremony, prayer, dance and sound healing. Heart Medicine is a singing duo comprised of Annmarie Soul and Karen Seva - blending original songs, mantras and native tribal chants. Together their voices blend in harmonic frequencies creating angelic overtones inviting the listener into a deep musical meditation journey. We come together to remember all the blessings we have and to strengthen our connection to spirit, to each other, and our own hearts alignment. WE ARE POWERFUL WHEN WE COME TOGETHER. WE REMEMBER WHO WE ARE WHEN WE ARE TOGETHER. Fill your heart and soul with healing melodies pulled through from the angelic realms, invoking, and inviting us to open and receive the gift of healing, wholeness, and remembrance. Heart Medicine Music is PRAYER CEREMONY. A place we come to remember our connection with earth and our ancestors, and a space to expand our awareness of Spirit and the unseen world. Sacred songs and Melodies inspired by nature and Spirit. The music of Heart Medicine is a combination of sacred songs and melodies inspired by nature and spirit, interwoven with healing mantras celebrating many traditions. Both celestial and earthly, each song is a gift from the muse of spirit , channeled and lovingly crafted - opening a doorway to the unseen, requesting our presence in a dance with the divine, inviting us into love, and calling our hearts home. Music begins promptly at 8pm. Udaya Live is coming up with the ultimate all-inclusive Yoga and Live Music retreat In the beautiful mountains near Sofia, Bulgaria. Join us for yoga, live music, dancing, swimming, community, and fun in the sun… just like summer camp. Celebrate your practice with a community of some of the finest and most diverse yoga teachers & musicians. Drop into an invigorating vinyasa class and flow to a live band, jump into a dance class and shake it or follow your bliss to a restorative or meditation class. Suit yourself by curating your own ideal yoga festival experience. with the exceptional musicians : Masood Ali Khan, Sheela Bring, Robot Nature, Dave Stringer, Spring Groove Gina Salá, Steve Gorn, DJ Sol Rising DJ Chakra Khan Anita Coats, Punnu Wasu, Clinton Patterson, Pascal de Lacaze-Duthier, Daniel Paul Christo Pellani, Joey Lugassy, Neelamjit Dhillon, Eddie Young, Scott Cambridge. Known as modern-day Glastonbury, the lands of Avalon honor all that is sacred. Full of myth & magic, Priestess and Druid traditions - here the flows of the Feminine & Masculine unite inside the temple of the Goddess. Ceremony, ritual, prayer, dance, song & communion with nature are the norm of the everyday during our time together as we welcome the web of sisters & brothers in support of each other to amplify and activate healing & positive change into the world. Circle inside the ancient stone spirits of Stonehenge (Masculine) & Avebury (Feminine) – 2 of the largest stone circles in all of Europe. Drink from the healing Red & White springs and be restored upon the Earth in balance with All Beings. Walk the ley lines of Michael and Mary, climb the Tor & stand at the High Altar of Alchemical Love inside the Glastonbury Abbey. Learn the teachings of the Wheel of the Priestess & the Wheel of the Year, Archetypes of the Feminine & Masculine, Sexuality & Relationship and engage with the power of Elemental Magic & Earth Ceremony as a sacred way of life. This pilgrimage offers space for both women & men to drop inside the alchemical dance of the Divine Feminine & Masculine forms and for each of us to commune with the offerings of the Earth so that we may experience the bounty of nature as medicine for the soul. This live retreat is the perfect complement to the online Urban Priestess Mystery School & a pilgrimage that will rest inside your heart for years to come. In Avalon, together we remember and together we rise. A beautiful candlelit concert at the Magdalene Chapel in Glastonbury of sacred music with Nalini Blossom & Masood Ali Khan. Masood Ali Khan from London now living in Los Angeles plays the enchanting Hang drum and sings sacred mantras. Sharing the evening is sacred singer Nalini Blossom offering Medicine music of the heart, honoring the Elements, the Divine Feminine and the Sacred Flame within. A rare opportunity to experience this intimate concert in such a devotional environment. Due to the limited space, We request no children at this concert that might disrupt the sanctuary. Presale tickets the UK pounds £11 PRESALE (approx US$14) highly recommended to get entry - This chapel holds only 30 people so book early to reserve your spot. Open seating. Please arrive at 7:30 pm. The concert starts at 8 pm. Remaining tickets available on the door UK Pounds £15. Join me for the Telluride Yoga Festival – July 19-22, 2018. Experience an unforgettable weekend of connection and inspiration at the 11th annual Telluride Yoga Festival nestled in downtown Telluride, this July 19-22, 2018. Join me and our OMazing teachers including: Gina Caputo, Amy Ippoliti, Sianna Sherman, Saul David Raye, Tymi Howard, Eric Paskel, Beryl Bender Birch, Tommy Rosen, Leah Cullis, Yogrishi Vishvketu, and Desiree Rumbaugh, Sally Kempton many more! with Sianna, Saul David Raye & Janet Stone and many great musicians. Join us for this annual gathering as we celebrate the rhythms and passage of life on the summer solstice at Esalen. Each year we return and offer ourselves to the land, sea, and each other. Each day, there will be offerings of asana classes from Janet Stone, Saul David Raye, and Sianna Sherman, including one “workshop” each day that explores the different ways we can support our practice of living yoga. Afternoon sessions will include partner Thai yoga, restorative practice, tantric philosophy for our modern lives, and meditation. Evenings will include kirtan, rituals, and the final evening will be a celebration and a reflection of our week spent together. Contact Esalen for info and bookings. Asia’s leading yoga and wellness conference of its kind, bringing together renowned presenters from across the world. Passionately dedicated to serving and offering access to the best yoga and global teachers for the region. For over a decade, Asia Yoga Conference has inspired change in the growing community, uniting the best of cultures for all bodies and minds. From world famous masters, up and coming talents and teachers from all lineages in yoga and beyond, we have empowered yoga teachers, inspired students and developed yoga community including yoga studios and networks. I'm performing at the Compass stage this year at Lightning in a Bottle! DEEP EXHALE with DJ Marques Wyatt and Cristi Christensen raising the roof!! Electric Daisy Carnival, commonly known as EDC, is an annual electronic dance music festival, with its flagship event held annually in Las Vegas, Nevada. The event primarily features electronic dance producers and DJs such as Armin van Buuren, Dimitri Vegas & Like Mike, Yellow Claw, and Tiësto. The festival incorporates all kinds of electronic music. This year DEEP EXHALE is coming with yoga and dance music at the SOL STAGE. Lucidity Festivals invites you on an epic saga of personal, collective, and global transformation. Beginning in 2012 with Lucidity’s first incarnation, we have explored two full trilogies and are embarking on a third. Each festival year presents another chapter of a larger mythic journey. Join us on this life-changing cycle, and ride the cresting waves of this beautiful metaphor we call life. Yoga, meditation and live music with Sianna Sherman and Masood Ali Khan at one of the most beautiful yoga retreat centers in Costa Rica at Pranamar Villas and Yoga Retreat. After yoga and delicious dining enjoy surfing whilst staying in luxury accommodations come early and head to the Envision Festival, Costa Rica. There is no better place to relax, rejuvenate and ease into the new year than at Esalens famous healing hot springs, moving the body with Yoga Master Peter Sterios and his intelligent yoga system, supported by live music with Masood Ali Khan and being nourished with home grown organic food while overlooking the beautiful pacific ocean and Big Sur's cliffs. So excited to return to Seattle, a city I have been to many times but never to perfrom my music - until now. For one night at Bala Yoga in Fremont I share a kirtan with the hang drum. We can sing and dance to the hang drum with sacred mantras, meditate and send out some global healing to celebrate my beloved Sianna Sherman's Teacher Training class that senior Rasa Yoga teacher Greta Hill has been teaching over the last month. Sianna is teaching a public class on Saturday and Sunday and I shall support the class on Sunday. So come and join the Rasa TT's and let have a beautiful night together. A night of deep loving heart, spirit and earth music & songs from ancient cultures and languages from around the world with the healing voice of Ayla Shaffer from the UK & Dharma Wisdom shared by Rita Hraiz, an international meditation teacher sharing solar philosophy and the laws of ageless wisdom. Masood Ali Khan shares a hang drum kirtan of sacred mantra. Ayla is a multi-lingual ‘world folk’ singer-songwriter and a visionary musical artist weaving together a stunning repertoire of original poetic songs with traditional and tribal music from across South and North America. With a growing presence she is a powerful voice in the world of ‘Ceremonial/medicine music’ and the rising global community of people who are committed to residing in harmony with the Earth. Ayla’s music has taken her around the world with her live performances that provide a sacred, intimate, heart-opening space for all who are present. This artist sings the song of the spirit and embodies the tales she tells, expressing a music that reverberates with deep heart, wisdom and soul. To experience the essence of this young songstress is to be taken down a musical journey that ultimately leads us back to the very core of our own inner existence. Bhakti Fest is the premier yoga, sacred music, and personal growth festival in the United States. Since 2009, for six days each September, we have featured the best Yoga Teachers, Kirtan Musicians, and Workshop Leaders in the world. We are part of the Center for Spiritual Studies, a 501c3 nonprofit that supports charities across the globe, mainly in India. Proceeds generated each year, after we cover our costs, go to our chosen causes. We accept donations to help us provide extraordinary festivals and give support to those less fortunate than us. We hope to see you in the Bhav! BUY YOUR FULL FESTIVAL TICKET direct from me for a special discount! ONLY $250 each.!!! normally $325. Email ME ASAP TO GET THIS SPECIAL OFFER! PAY ME BY PAY PAL & I WILL SEND YOU A SPECIAL CODE TO USE WHEN YOU GO TO THE PURCHASE WEBPAGE. YOU CAN ADD OTHER OPTIONS SUCH AS CAMPING ( camping is not included in my ticket offer). Udaya Live is an all-inclusive international retreat style festival in South Eastern Europe. Join us for yoga, live music, dancing, swimming, community, and fun in the sun… just like summer camp. Featuring Tina Malia, Dave Stringer, Sheela Bringi, Breath Of Life Tribe, Gina Sala and renowned yoga teachers Sianna Sherman, Annie Carpenter, Dylan Werner, Rudi Mettia, Micheline Berry, Emma Henry and so many more. Gathering of Light Greece Retreat - Don't wait to book as this is almost sold out! For third year in a row we gather to offer this exceptional Yoga retreat in Paros island. This retreat became a custom for us at Cihangir Yoga in Turkey and Bhāvanā Yoga in Greece and we are proud and happy to be able to bring together a worldwide community to share what we love. This year, Zeyneb Uras and Konstantinos Charantiniotis come together with Sianna Sherman and Masood Ali Khan to offer you a transformational retreat! Your 6-day yoga retreat takes place on the beautiful Cycladic Island of Paros, at the stunning Okreblue Hotel during the longest days of the year. At this magical place, under the bright light, you will unfurl your heart rays in the Sun & Sea, practice yoga, chant mantras, soak in the life force energy and rejuvenate in the magic of the Greek Islands. We gather as yogis in the days of summer to celebrate the power of light. As we magnify our own light, we supercharge the light in our communities and families. Daily rhythm includes but is not limited to: yoga, meditation, pranayama, chanting, dancing, live music, laughing, swimming in the sea, soaking in the sun, eating the most outrageously delicious Greek food, sleeping sweetly, bonding with beautiful beings, star- gazing, cat-napping and spontaneous adventures of immense JOY! These six days offer a chance to connect with an international community of beautiful yoginis &amp; yogis, along with four inspiring teachers. If you want to enchant your soul, delight your senses and invoke the heart of yoga in the whole of your life, just ... Come! Come as one, Come as family, Come with friends, Come with your lover, Come whatever age you are and come whatever degree of yoga you may be… all styles, all people, all welcome! Con más de 700 asistentes provenientes de todo México y USA, hombres y mujeres, con un estilo de vida orientado al cultivo de salud integral y el desarrollo de la mente, el cuerpo y el espíritu. Tenemos el gran honor de contar con la presencia de maestros reconocidos mundialmente y los mejores a nivel nacional. La Cuarta Edición del Congreso de Yoga Monterrey se llevará a cabo los días 26, 27 y 28 de Mayo de 2017 en el Centro de Convenciones Pabellón M.
Creado para generar una atmósfera de aprendizaje y experiencia dentro de un marco seguro, transformador e inspirador que permita a cada participante profundizar y conectar con su potencial a través del yoga. Dentro del evento habrá talleres y clases de yoga para todos los niveles, conferencias, meditaciones, Expo Yoga y Bienestar, yoga para niños, demos y mucho más. Yogafort is a collaborative experience between yoga, dance, meditation, fitness and Treefort Music Fest musicians. All classes are paired with live music, from DJs to xylophones to sitars and guitars. Experience local flavor interwoven with international sensations. Enjoy 3 days of yoga, dance, live music and kirtan with your Yogafort pass. As a celebration dedicated to awakening our human potential, Envision provides a platform for different cultures to co-exist in sustainable community, and inspire one another through art, spirituality, yoga, music, dance, performance, education, sustainability and our fundamental connection with nature. Deep Exhale in the Sky Yoga and Dance With DJ Marques Wyatt & Cristi Christensen. "Deep Exhale" is a yoga-dance collaboration between Marques Wyatt (legendary DJ + founder of LA house music institution DEEP Events), and international yoga teacher Cristi Christensen. On Feb 18th we're on the expansive rooftop deck at ROW DTLA, breathing in a 360-degree sunset view -- from the mountains to the coast. In this all-level yoga workshop, you can discover an intuitive way to relate to your practice, where we avoid taking ourselves too seriously and are open to finding humor in our practice in the most refreshing and enlightening ways. Through the practice of yoga with LEVITY in Heart, Mind, and Body, you can feel the effect this type of practice has on your immune and nervous systems, which allows your inherent natural healing forces to work as they were intended. Fun heals on so many levels - intelligent fun even more so! Winter Solstice is a moment of profound mystery. In the darkest night of the year, there is the mystical rebirth of the light. This festival is a sacred threshold where the portal opens and the Sun of the Heart is reborn into the world. We are called to renew and transform ourselves from the embrace of darkness into the flame of love. Yoga is a ritual of the heart, mind, body and soul. Yoga Ritual is Sianna’s signature offering where the practice of yoga is infused with ceremonial magic to connect you with the directions and sacred gateways for your vision, transformation, healing and wisdom.. Sianna will lead an elegant asana flow with myth, mantra and mudra. Masood will offer his sublime music of the hang drum and a guided meditation for the rebirth of the light within. This is an alchemical offering in service to the Whole of Humanity for love, light and peace. All Levels are Welcome. Please bring a tea light in a candleholder.